LMPTP inhibitor 1 (hydrochloride) is a selective inhibitor of low molecular weight protein tyrosine phosphatase (LMPTP), with an IC50 of 0.8 μM LMPTP-A. LMPTP inhibitor 1 (dihydrochloride) is a selective inhibitor of low molecular weight protein tyrosine phosphatase (LMPTP), with an IC50 of 0.8 μM LMPTP-A. LMPTP inhibitor 1 is a potent molecule for diabetes which can increase liver IR phosphorylation in vivo and reverses high-fat diet-induced diabetes by inhibiting the IR phosphatase LMPTP. MDK3465 is a potent protein tyrosine phosphatase 1B (PTP1B) inhibitor with an IC50 of 50 nM. 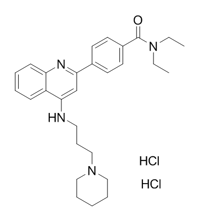 TCS-401 (HCI) is a selective inhibitor of protein tyrosine phosphatase 1B (PTP1B). TCS-401 is an insulin receptor sensitizing agent; Selective inhibitor of protein-tyrosine phosphatase 1B (PTP1B). BN82002 controls the biological activity of CDC25 Phosphatase. This small molecule/inhibitor is primarily used for Phosphorylation & Dephosphorylation applications. 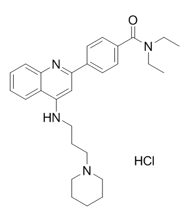 F1063-0967 is a Dual-specificity phosphatase 26 (DUSP26) inhibitor with an IC50 of 11.62 μM.